The State of Canadian Forests Annual Report 2017 just came out. The report provides an overview of what’s happening with Canadian forests and forest products. I have used it for over twenty years to better understand what are the influencers and trends affecting lumber availability and markets in Canada. The report always serves to remind me that there is immense competition for Canadian forest products and this is particularly mindful this year with the run up on both softwood and hardwood prices and the tight availability of raw material for the wood packaging industry in Canada. 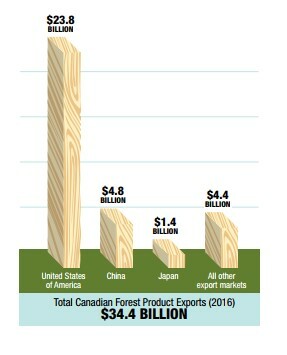 There is a great little chart in the report that puts Canadian forest product exports in perspective and shows just how big of a share the US still has of the Canadian export markets. One trend that is highlighted in this report is the new industry structure, in which we have seen an evolution from Canadian wood product companies in North American markets to North American wood products companies in global markets. This restructuring is having an impact on the lumber supply chain for our industry in a number of ways. The consolidation going on with Canadian lumber producers means fewer mills to buy from but we are also seeing an evolution in improving supply chain efficiencies and go-to-market strategies. The lumber producers operate very well run sales organizations, and know the North American and global markets very well. Many of the wholesalers that I talk to comment that they just can’t get the volume of material they used to from the lumber producers that they were able to do a few years ago. That is making it difficult to get the sort of material they need to supply their wood packaging customers. Value added manufacturing by the mills themselves. Case in point, there used to be a lot of green mill run rough material coming out of mills in north eastern Quebec, but now some of those mills are doing their own re-manufacturing for export trade. The result is a huge run up in price on mill run rough, double what it was five years ago, and a shortage of this material on the market. The same experience is felt in western Canada, where one of the largest manufacturers of grade lumber on the West Coast has set up a plant to manufacture unassembled pallets thereby removing economy lumber from the market and moving into a product market previously established by the wood packaging industry. As lumber producers look for new avenues for growth we can expect to see more of this type of activity and its typically significant influence on availability of raw material. With the current exchange rate, Canadian producers have a price advantage on both North American and overseas markets, which in turn continue to have a large impact on domestic pricing and availability . Since the summer there has been strong pressure on eastern hardwood markets. China has been active on the west coast markets but not many realize they are also active in eastern hardwood markets, both on logs and 2 and 3 common hardwood which has put a lot of pressure on how cants are sawn in eastern North America. The railway cross tie markets in the US is putting pressure on hardwood cant availability. Depending on the season, between 50-70% of the aspen cut in Eastern Canada ends up in the US. The period between September-November is a heavy booking period for US clients who don’t like sawdust that comes on frozen aspen in the January-March season. The exports of all Canadian softwood lumber grades are surging into the US ahead of November 14th, 2017 announcement, when the US Department of Commerce’s final determination in both CVD and AD is expected to be released. This will be followed by the final injury determination by the International Trade Commission expected by December 21, 2017. This heavy flow of lumber into the US continues even as the Canadian and US governments continue to try and negotiate a new Softwood Lumber Agreement. Risk is the possibility of not buying because you feel the prices are just too high and then being caught without product in the yard. Risk is the possibility of losing customers over having to go back to clients for price adjustments. It’s hard to say whether the availability of lumber will be a short term problem for our industry or whether these availability problems will be with us over the longer term. We are not the only ones facing this challenge , the wood packaging industry is facing the same south of the border with tight availability and as we can see in another article in this month’s newsletter that the same challenge is being faced in the UK as well. The best approach to managing risk is to stay informed about market conditions.